Nick Hornby has arguably enjoyed better results adapting other people's work (An Education, Wild, Brooklyn) than when his own books (Fever Pitch, High Fidelity, Long Way Down) hit the big screen; despite three writers tackling his novel Juliet, Naked, the result is a serving of singularly weak sauce. While it might just satisfy those seeking Richard Curtis rom-com without the (well-worn) jokes, it's twee when it needs to have bite. 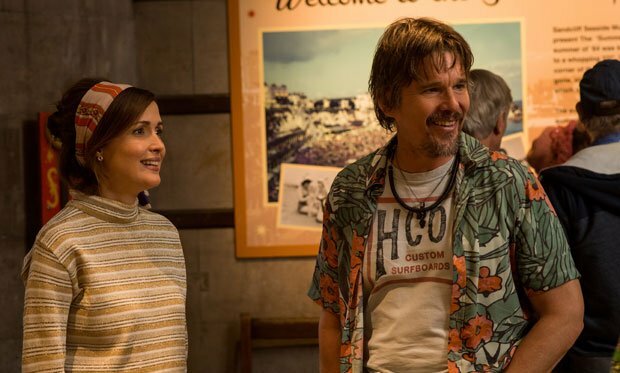 Picking up on the fanboy musical riffing from High Fidelity, Juliet, Naked features a love triangle involving reclusive American recording artist Tucker Crowe (Ethan Hawke) and dowdy Thanet couple Duncan and Annie (Chris O'Dowd and Rose Byrne). Duncan, a media lecturer, is obsessed by Crowe's music, while Annie's desire for children is frustrated by her partner's relentless man-crush. Posting on an internet message board leads Tucker and Annie into an unlikely email relationship, and the songwriter travels to the UK to meet her. Duncan's dalliance with a female student provides Annie with a perfect excuse to leave her partner, but is Tucker Crowe right for her? Taking the title of one of Crowe's fictional albums (Hawke performs songs by Ryan Adams and Conor Oberst), director Jesse Peretz has pulled together a likeable cast, but saddles them with a soppy narrative that never gels. Tucker is shorn of any artistic darkness and presented as a too-good-to-be-true prospect, whereas Annie's maternal drive is depressingly one-dimensional. Even Duncan's ridiculous level of obsession never pays off in terms of laughs or pathos; he's just an obnoxious know-it-all who elicits zero sympathy. Despite Hornby's considerable cache as a writer, the script, credited to the director's sister Evgenia Peretz, Jim Taylor and Tamara Jenkins, is clearly the weak link here. Juliet, Naked is a cute but generic rom-com that's short of rom and almost completely devoid of com. General release from Fri Nov 2. Duncan (O’Dowd) is a media lecturer obsessed with the music of reclusive Tucker Crowe (Hawke), while Annie (Byrne), Duncan’s partner, wants children and is frustrated by her partner’s man-crush. A likeable cast can’t do much with a soppy narrative; this generic rom-com is short of rom and almost devoid of com.